It’s hard to believe that something you can buy pounds of in the supermarket could have as powerful an effect on your brain as an illicit drug. Yet scientists agree that sugar actually works in much the same way as addictive substances like cocaine. In fact, while its effects may not be quite as noticable, studies have shown sugar can be even more addictive than cocaine. In his research with rats, Dr. James DiNicolantonio of Saint Luke’s Mid America Heart Institute found, when given a choice between cocaine and sugar, the animals favored the sweet stuff an overwhelming majority of the time. While the findings of animal studies don’t always translate to humans, the remarkable difficulty most of us have in resisting the allure of sugar suggests, like it or not, we are probably not so different from Dr. DiNicolantonio’s rats. The worrisome thing about sugar addiction is its detrimental effects are slow moving. Many people don’t even realise they’ve been causing damage until it’s too late. What exactly happens when you eat too much sugar? Well, excess sugar consumption has been linked to obesity, type II diabetes, cancer, premature aging, acne and many other afflictions. If you’re keen on avoiding these conditions and protecting your health, read on to discover 7 instantly recognizable signs that your body is getting too much sugar. Are you Experiencing Lack of Energy and Fatigue? While sugar can certainly increase your energy during the moments immediately after you eat it, this comes from a blood sugar spike which in turn spikes your insulin, and just as with the laws of gravity, what goes up must come down. The brief spurt of energy produced by excess sugar intake results in a sugar crash once it wears off. If repeated over time, this can lead to a generalized feeling of tiredness and fatigue. So, if you’re waking up exhausted, even after a full night’s sleep, excess sugar could well be a factor (this is definitely a symptom worth chatting to your doctor about). Do You Get Sick Often (Colds, Flus and Infections)? Regularly consuming large amounts of sugar can have a detrimental effect on your immune system, weakening your defenses and making you far more prone to coming down with any colds, flus or other nasty viruses that may be making the rounds. Fortunately, your risk factors can be reduced by lowering your sugar intake and sticking to a healthy diet full of whole foods rather than processed, sugar-laden ones (though your favorite sweets can, of course, be enjoyed as a treat every now and then). Is Your Brain Foggy After Meals? As we mentioned earlier, the high from sugar consumption is short-lived and, once it wears off, your brain is left feeling foggy and unfocussed. If you find yourself struggling to concentrate at work in the afternoons and reaching for coffee or more sugary snacks to get you through, you may want to take stock of just how much sugar you’re consuming to see if this could be the underlying cause. Do You Constantly Crave Sugar and Carbs? 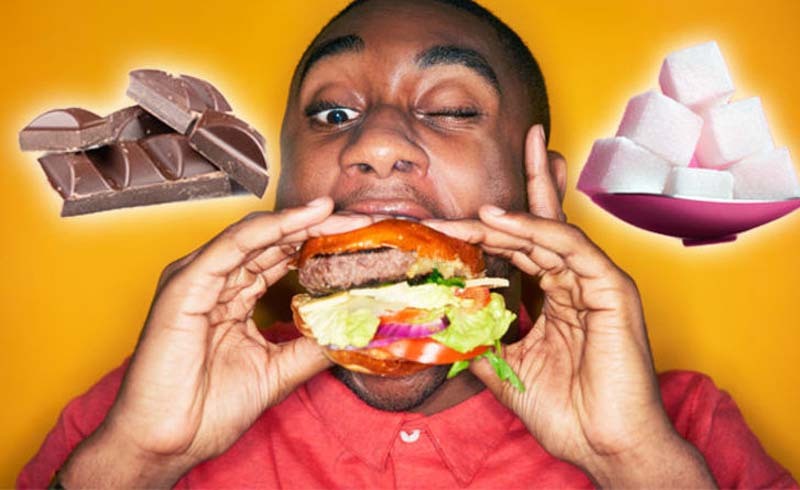 Cravings are one of the biggest signs of addiction and, as we mentioned earlier, sugar acts on our brains in much the same way as an addictive drug. If you find yourself irresistibly drawn to sugar and simple carbohydrates (like bread, pastries, cereals and pasta), it may well be that you are already a sugar addict. While it may seem impossible to go through a day without the desire for chocolate, pastries, sweets and snacks, those who’ve kicked their sugar habits almost unanimously report that, after the first few weeks of agony, their desire for sugar actually completely subsides. Have You Been Struggling With Weight Gain? If you’ve been feeling the pounds creeping on, or even if you’re trying to lose weight and feel that your progress has stopped, sugar could well be at the root of your problems. And it’s not just sugar’s empty calories that are to blame. You see, sugar stimulates insulin production as insulin is the hormone responsible for transporting sugar to cells where it can be converted into energy. Excessive sugar consumption leads to overproduction of insulin which can have a whole cascade of flow on effects, not the least of which being weight gain. Type II diabetes and cardiovascular disease can, unfortunately, also follow. Do You Find Yourself Adding More Sugar to Get the Same Sweet Hit? Whether your drug of choice is cocaine or sugar, one thing’s for certain: your body will develop a tolerance to it. As your taste buds grow accustomed to your usual sugar levels, you will (as we mentioned earlier) start craving more sugary foods and simple carbs. Over time, sweet things can start to lose their edge, meaning that teaspoon of sugar you add to your coffee may creep up to two and you may find yourself picking up a a full-size chocolate bar for your afternoon pick-me-up rather than a snack size. The good news is, when you break the cycle and cut back on your sugar intake, your tolerance will go down too. Do You Suffer From Dark Circles, Skin Problems or Plantar Fasciitis? The link between sugar and inflammation has been well-established by science. While some people can get away with a bit of extra inflammation, those prone to skin conditions often find that sugar triggers problems like acne, eczema and rosacea. Dark circles and puffiness around the eyes can also be exacerbated by excessive sugar consumption. Sugar’s inflammatory effects can even extend as far as your feet with plantar fasciitis now linked to excess sugar in the diet. Once again, though, there is good news. If you can take the plunge and find healthy replacements for all your favorite sugary treats, your skin (and your feet) will thank you. Giving up sugar may be a difficult sacrifice but the glowing skin, healthy complexion, happy feet and (most importantly) healthy body you will be gifted with as a result are well worth the effort.